A pedestrian passes the Department of Housing and Urban Developement at the start of the third day of a shut down of the federal government in Washington, Jan. 22, 2018. Senate minority leader Chuck Schumer says Democrats in the chamber will vote to reopen the government, which has been partially shutdown for three days. Earlier, President Donald Trump attacked Democratic lawmakers in new Twitter comments, saying, "The Democrats are turning down services and security for citizens in favor of services and security for non-citizens. Not good!" He contended that "Democrats have shut down our government in the interests of their far left base. They don’t want to do it but are powerless!" White House legislative affairs director Marc Short told CNN that the Trump administration wants "to find a pathway" for the young immigrants, many of whom only know the U.S. as their home country, to stay in the United States. But Short also said "a real security threat" remains on the southern U.S. border with Mexico, with Trump demanding funding for a wall to thwart further illegal immigration. A new Trump political ad accuses Democrats of being "complicit" in U.S. murders committed by illegal immigrants. At the same time, Senate Democratic leader Charles Schumer said late Sunday that Democratic and Republican lawmaker had “yet to reach an agreement on a path forward” linking the full reopening of the government to resolution of the deportation issue. Earlier, in a Senate speech, he called the partial government closure the "Trump Shutdown," contending that he offered the president funding for the wall, a key 2016 Trump campaign promise, but that the U.S. leader would not compromise on other immigration policy changes. "He can't take yes for an answer," Schumer said of Trump. White House spokeswoman Sarah Sanders told reporters, "We're not going to start having negotiations about immigration reform until the government's reopened. It's pretty simple." The effect of the shutdown was relatively minimal over the weekend, but on Monday, federal agencies moved to furlough without pay thousands of workers considered to be non-essential. They halted some portions of their operations when no agreement was reached in the Senate on Sunday or in the early hours of Monday. The U.S. government has partially shut down on several occasions over lawmaking and funding disputes. 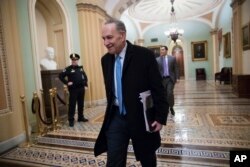 The most recent was a 16-day shutdown in 2013 in a partisan deadlock over health care policy. About 850,000 federal workers were furloughed then. 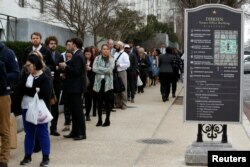 Congressional staffers wait in an excessively long line to enter the Dirksen Senate office building during the third day of a shut down of the federal government in Washington, Jan. 22, 2018. Services that stop or continue during a federal shutdown vary. But federal research projects could be stalled, national parks and museums closed, tax questions left unanswered, processing of veterans' disability applications delayed, and federal nutrition programs suspended, as was the case in 2013. Senate lawmakers spent all day Sunday meeting and negotiating and looking for a way to end the impasse on immigration that forced the government shutdown at midnight Friday. But it was unclear exactly how much progress had been made. Maine's Susan Collins, a Republican moderate, told reporters a group of 22 of her colleagues were determined to find a way to resolve the conflict. 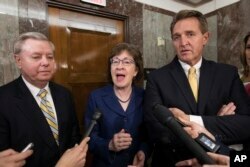 Sen. Lindsey Graham, R-S.C., from left, Sen. Susan Collins, R-Maine, and Sen. Jeff Flake, R-Ariz., speak to reporters after working with a bipartisan group of moderate senators to find a way to reopen the government, at the Capitol in Washington, Jan. 22, 2018. McConnell called off a 1 a.m. Monday vote on reopening the government in favor of the vote at noon, Washington time. With Republican and Democratic lawmakers blaming each other for the stalemate, Graham on Sunday also appeared to fault the White House for the immigration standoff, specifically hardline immigration Trump adviser Stephen Miller. "Every time we have a proposal, it is only yanked back by staff members," Graham said. "As long as Stephen Miller is in charge of negotiation on immigration, we are going nowhere." Graham said Miller is out of the "mainstream" with his immigration views. There has been no response so far from the White House on Graham's comments. Sanders called Graham's comments "a sad and desperate attempt...to tarnish a staffer." She said Miller was not at the White House "to push his agenda," but rather to support Trump's immigration views.